Oxtail Soup Recipe - could try to serve as an alternative option if you already are confused about what to cook for the family. This dish has flavor in the sauce is very tasty and very good course, especially if you are fond of the oxtail. Many people are adept at making oxtail soup but not so good and still smelled fishy. There is a specific way to do that tastes good and flavorful Enah appetizing. Grain not only of soup and oxtail alone but you can add some vegetables as supplementary material. 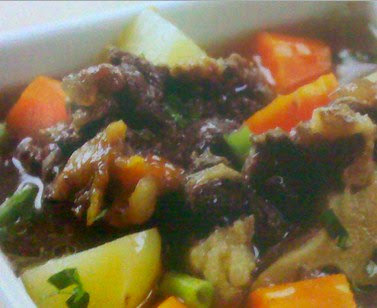 With the kada protein plus vitamins in the vegetables fried oxtail soup is so favorite recipes most people in Indonesia. Boil oxtail with added salt, pepper, garlic and ginger until tender. Remove and drain. Fried oxtail, remove and set aside. Then saute ground spices until fragrant and ripe. If you've cooked stir-fry seasoning enter into one liter of water in the broth simmer. Add spices, nutmeg, ginger, potato, pepper and carrots, and cook until done. Shortly before his appointment put tomatoes. Lift and prepare a serving bowl, pour the soup into it and sprinkle the scallions and celery.